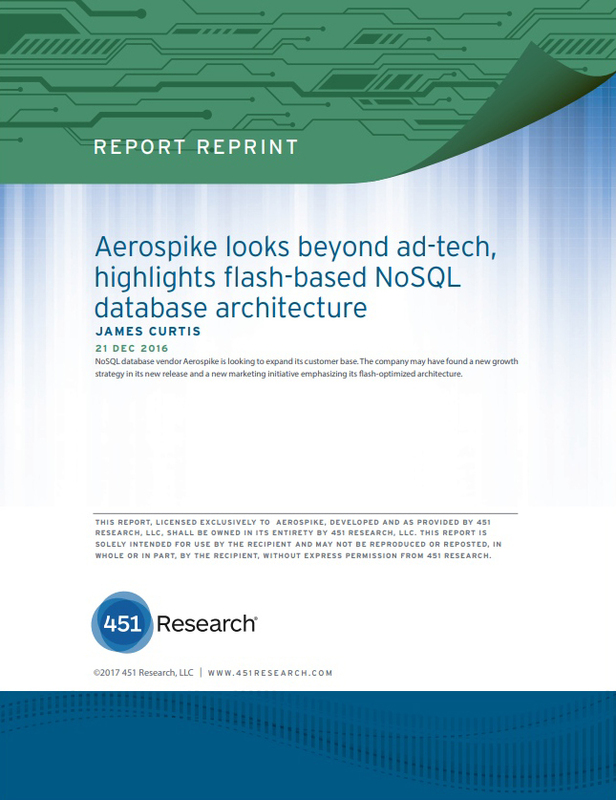 James Curtis, Senior Analyst, Data Platforms & Analytics with analyst firm 451 Research, recently published a report about Aerospike’s success and growth strategy. Read about Aerospike’s expansion beyond adtech firms and into enterprises in industries as diverse as telecommunications and financial services, and about its key differentiator – a unique hybrid memory architecture that powers systems of engagement for the digital enterprise. When learning about what is the NoSQL database market, the company plays in the NoSQL database space and is differentiated by its optimized, flash-based architecture. Aerospike has traditionally found success with ad-tech customers, but the company is looking to aggressively expand its footprint to other enterprise clients, including financial services and telecommunications, for example. The company is pivoting its go-to-market messaging with a renewed emphasis on its differentiated architecture. With this renewed marketing and customer focus in place, along with a recent database update, Aerospike is reporting some positive growth gains. The company stresses scaling and speed as core features and likes to tout its optimized flash-based and DRAM architecture. The company has traditionally done well with ad-tech clientele, but this past year, it has demonstrated good traction with the enterprise, adding approximately 40 new customers – which indicates that the company has found its growth strategy. The NoSQL space, however, is quite competitive. While some other NoSQL databases can run on flash, given Aerospike’s success, we could easily see other NoSQL vendors looking at this area as a means to further optimize performance. Aerospike offers two versions of its database: Aerospike Community Edition and Aerospike Enterprise Edition. The difference comes down to degree of support; enterprise features, such as a management console, replication and security; and additional testing and validation. As noted, Aerospike architecture is differentiated in that it leverages DRAM and flash SSD storage, which means that Aerospike doesn’t incorporate a caching layer as part of its design. Although it runs on flash, Aerospike points out that it has been optimized for SSD memory and as a result, the company claims that it has achieved as much as a 30x performance improvement base on internal tests of certain relational databases. With an emphasis on enterprise customers and Internet-facing applications, Aerospike is making improvements that closely align with this strategy. A few notable development focus areas are worth pointing out. One such area is data connectors. Realizing that its database will be part of a broader data environment, the company is putting increased emphasis on building out its connector strategy. The other area is data consistency. The company enables Aerospike to be tunable, such that it can be geared to favor transactional consistency or to be tuned to relax it for an eventual consistency set up. While the company has made some recent database updates, the overall emphasis has been on hardening the database for enterprise deployment. Please fill out the form to the right and we will send an email to you with a link to the report and to learn more about what is the NoSQL database market.